Custom designed and built websites for Union candidates. 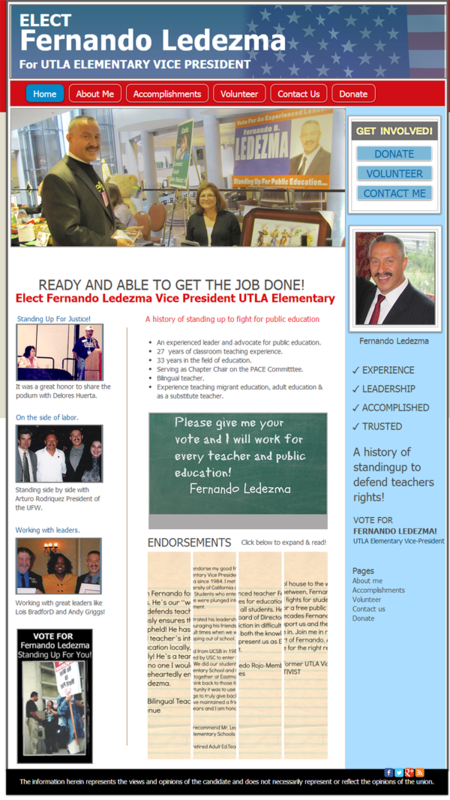 Fernando Ledezma ran for a spot as Vice President of UTLA's Elementary School teachers in the Los Angeles Unified School District. He fought for a quality public education for every student and fair due process rights for every teacher throughout his long accomplished career. We built him a website that helped him get his message out to his potential voters for his campaign. We made sure to feature his strengths like his years of experience, legislative accomplishments and history of working as an activist on the front lines of public education. We highlighted his endorsements with an interactive accordion panel so users could quickly see who was standing with him in his campaign. We created contact forms to make it easy to get volunteers and of course campaign donations! If you in a union election, know or represent someone who is and you want to help them win and succeed as an advocate be it for public education or workers rights, please contact us and let us know how we can help you. CONTACT US TO GET YOUR WEBSITE DELIVERED NOW! We Need You To Win So We Can All Win Together!